Has The Scobleizer discovered a hidden, perhaps even fatal flaw in the whole Lean Startup rationale? Or are the startups that are pitching him (or their investors and advisors) deviating from Eric Ries sacred doctrine? According to The Lean Startup, the term MVP (Minimum Viable Product) is not really meant to be a product, as much as it’s meant to be the basis for a specific ‘market test’. The reason for doing the test is to try to validate a single hypothesis. The hypothesis relates to a particular feature, or set of features (or a change to a previously deployed feature or feature set) in the thing that you provide to the user (and that thing that you provide may not actually seem like a product at all, it might just be something on a web page, and the test may for instance be just to see whether anyone relevant would be interested enough to click on it). The Viable aspect is ‘just enough functionality to allow you to conduct the test’. What Scoble is reacting to is probably a misunderstanding (but probably not by him) of what viable means in this context. Scoble, if you are going to try to pitch to him, is one of the most ‘pitch-bombarded’ people out there. Your MVP is going to need to leave him in a state of shock (in a good way) if you are going to have him sing your praises. 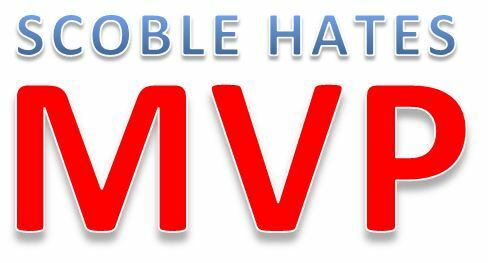 V for viable, in the context of pitching Scoble, if you are ‘testing a value hypothesis’ means that the value of what you are doing has to be absolutely crystal clear and that the differentiation from your competitors has to scream. This is not because Scoble is unusually insensitive to subtle differences or improvements, but instead, because Scoble tries not to miss any important innovation in software, Minimum is not exactly minimal for him. If you’re going to pitch Scoble, remember he hates ‘minimal viable products’. Personally, I’d wait until you’ve been through the ‘Build-Measure-Learn’ cycle quite a few times before you pitch anything to him. If you desperately want to show him an early (raw and definitely MVP) build (just like Microsoft staff used to, when he worked there) you’ll need to fascinate him by drawing him into your hypotheses (but I’m not sure whether he’s into such things as NDAs). Scoble is actually always looking out for ‘small stuff’ that everyone else has either missed or dismissed, but if you ‘go too minimal’ then he’ll quite possibly (dis)miss your stuff too, so a bit of up front ‘expectations management’ may be needed if you’ve got some genuinely ground breaking stuff in a form that could easily be mistaken for a ‘me-too copycat (with what seems like a less-than-earthshaking tweak) offering’ if it needs to be pitched to him in its MVP state.